Our garden sheds, Potting sheds, Summer Houses and Workshops all have the same or similar build to the images below, we offer so many kinds of cladding such as 12mm T&G shiplap, 9mm overlap, 15mm T&G tanalised shiplap to the thick 15mm T&G log style wall cladding. Rainbow also offers two size options for the framing allowing you a more bespoke product, we also offer so many optional upgrades making each and every building customisable to your needs. When is a pent roof shed the ideal option, if your going to situate close against a boundary fence or wall, will the pent shed be going under any low hanging branches. You must take into account the roof slopes front to back or from side to side as the images above show so obviously you must make sure the highest point fits without being too close to branches or other structures. The pent style is one of the most useful garden sheds available, making an easy layout for shelving and excellent internal workspace. 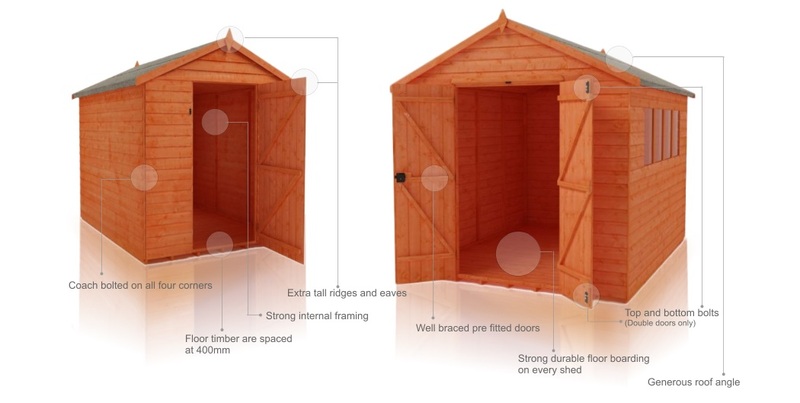 How would an apex shed be different to a pent shed, well they look so much different at a glance but the main difference is the roof that’s made in two wooden sectional panels that meet neat at the highest point of the gable called the ‘ridge’ to create an impressive upturned ‘V’ shape or hip style roof. The key feature of any apex is the highest point runs down the centre of the shed unlike any pent style that’s almost flat looking. Like all of our garden buildings other than the wall stores and playhouses we offer generous eaves and extra tall doors that will eliminate the need to stoop, the apex style also makes a perfect area to store or place shelving down each side of the door, did you know we also have a range just with double doors plus most of the range can now have them added for an additional cost.